Anyone who has lived overseas for any length of time will know what I am talking about when I mention that there is always one specific thing that we miss from back home. Oh no, I’m not talking about the big stuff, like family, friends and our house back home; of course we all miss that. What I’m talking about is those little things, the things that identify with home, but that we so totally take for granted until we move to foreign climes, and they are no longer available. For some people it is something as simple as marmite, or if the advertisements are to be believed, then Vogels Bread, but for me the iconic New Zealand product that I’ve longed for and lusted over since arriving here three years ago, is the humble can of beetroot. able to source some lettuce from the local market, so no problem there. Bread, in the New Zealand style however was and still is hard to obtain. There is plenty of bread here but variety is virtually non-existent. Sliced bread as we know it in New Zealand comes in only one style – plain white. There are other breads available, such as pandesal, which is a small, sweet, bun that you eat warm, and spread with butter or margarine, but for sandwiches my choice was limited to plain, white bread. The rest of the sandwich was pretty easy to concoct – a dab of mayonnaise, some tomato, slices of cucumber and a slice of cheese. Being a very hot country we are limited in the varieties of cheese that we might see back home, but for the sandwich, processed slices of cheese serve the purpose adequately. So, my sandwich was complete...or was it? There’s no doubt the sandwich was tasty. I’ve even managed to convert my wife to eating sandwiches with me for lunch, or taking one with her when she was working, but for me, something was sorely missing...my beetroot. I arrived in Manila, the capital city of The Philippines just over three years ago, to start a new beginning with my soon to become wife. To say that the past three years have been ones of happiness and joy, would be to say the very least. I look back at the past three years and marvel at how well I’ve adapted to and fitted into what really is a totally alien environment for me. Despite how well I’ve been accepted and have adapted to living here there has always been something missing from my life; and it is that ubiquitous can of beetroot. One thing I learnt quickly when I arrived here in Manila was that I better learn to like eating rice. After all, we have rice with literally everything; breakfast, lunch and dinner. If that’s not enough, many of the “merienda” snacks are made out of sticky rice. It is not without reason that rice is seen as the staple meal of most Asian nations. It never ceases to amaze me that even when we get to eat out at the mall and we visit a fast food franchise; say McDonalds, Burger King, KFC, or The Philippines own indigenous fast food outlet Jollibee, the kids, my wife, our friends all order meals that come with rice. I almost feel like screaming; “For goodness sake, we’re not at home now, we DON’T have to eat rice with everything. Order a burger for goodness sake”; but of course, they just order their rice and fried chicken and sit down to devour it happily. Returning to the thrust of this topic; my beloved beetroot - One way I determined that I wasn’t going to eat rice three meals a day was to introduce my family to an old Kiwi favourite for lunch; fresh salad sandwiches. One of the things that struck me early about this country is that they are not as typically Asian as many countries in South East Asia. After 400 years of Spanish rule, followed by 40 odd years of direct American rule and then another 40 odd years as an American armed forces outpost, The Philippines has embraced and adapted many western habits, attitudes and mores. Their choices of cuisine are often influenced by European and American styles, but of course always with their beloved rice. Sandwiches therefore were not totally unknown here, so it wasn’t like I was trying to convert the heathen to Christianity or anything quite that difficult, but finding the ingredients that I knew and loved from New Zealand, was not as easy as I thought. I made initial inquiries of the family, asking where I could buy beetroot. I was greeted by blank stares. “What is beetroot?” was the query from them. 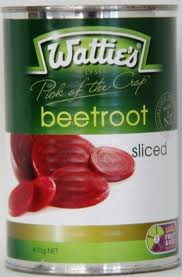 After Googling an image of the iconic Watties Beetroot can, they were none the wiser. “I’ve never seen anything like that before,” was my wife’s response. Every time we went to the supermarket I was on a mission to find a can of the elusive stuff, but to no avail. Where it should have been in the Supermarket aisle, it was nowhere to be seen. Canned tomatoes – sure; Canned carrots – of course; Canned peas – absloutely; Even Canned olives or pimentos – you bet; BUT beetroot – not a single can to be found. In desperation I turned to the internet. I actually Googled the following question: “Where in Manila can you find beetroot?” I was quite astounded to find many people had asked the same question and YES, there is one company here that makes beetroot in a can – Del Monte Corporation. The next question had to be where I could buy it. Most people who answered said that it was available in the really big supermarkets and was displayed in the “sauces” area or the “International” area. I discussed with my wife that we needed to take a trip to Taguig to visit the brand new Supermarket that had opened there recently as they were reputed to have the largest “International” section in Manila. Fortunately the Universe was smiling on me, as the very next weekend when we were shopping at SM Fairview, our local supermarket, I glanced down to the very bottom shelf in the canned vegetables section and lo and behold, staring back at me was the most beautiful sight in the world – 3 shiny cans of Del Monte Beets. It may have had a different name, but it was beetroot. “A rose by any other name would smell as sweet”. As I recall, I screamed; “Oh my God, it’s beetroot”, much to my wife’s chagrin. I grabbed the three cans and threw them into the shopping trolley. So, my great beetroot hunt is over now and lunch is now the most satisfying meal of the day, as I complete my “perfect” sandwich, with that beautiful purple juice staining and coming through the bread. As I munch my lovely sandwich I reflect on just how lucky I am to live in this wonderful country, with these amazing people and of course – beetroot!